(Bloomberg) -- Wynn Resorts Ltd. shares extend their advance to eight days, the longest since March 2017 according to Bloomberg data. The stock rose as much as 3.6 percent early Monday after the casino operator was upgraded to buy from hold at Jefferies. Shares have now gained as much as 25 percent over the past eight sessions. Better-than-expected gross gaming results, “recent positive regulatory developments for competitors in both Macau and Singapore” and increasing evidence of a Chinese economic rebound were cited in analyst David Katz’s upgrade of Wynn, and for contributing to the year-to-date price appreciation. 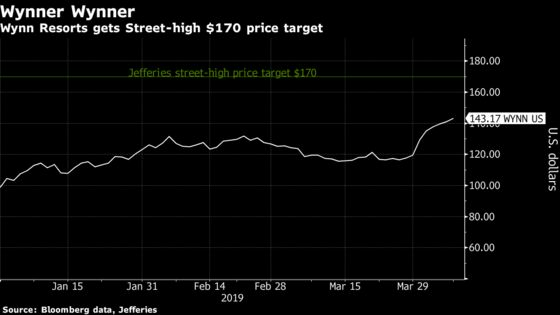 He also boosted his price target by 42 percent to a Street-high $170 per share, which implies approximately 21 percent upside from Friday’s close. Wynn Resorts is expected to report first-quarter results toward the end of this month, according to Bloomberg data.